Mitchell-Innes & Nash is pleased to announce Specific Objects, on view at our 1018 Madison Avenue gallery. 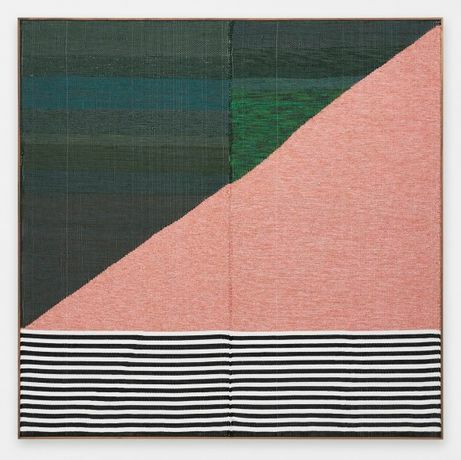 Specific Objects features eight new woven paintings by Canadian-born artist Brent Wadden. This will be the second exhibition with the artist since he joined the gallery in 2014 and his first in our uptown space. Utilizing found or second-hand fibers like wool and cotton, Wadden works on a loom to create geometric abstract woven paintings. Not unlike Color Field painting of the 1960s, Wadden’s paintings communicate a sense of monumentally or infinity, evoking the expanse of a landscape. Unlike a pristine canvas, however, the viewer finds intimacy in the labor-intensive process. Having never received formal training in weaving, the artist leaves small fissures and inconsistencies in the composition, offering evidence of his own hand and labor. The elements of collage and chance are present in the work. Wadden stitches together up to four independently woven panels in order to create a unified abstract form. The seams of the panels as well as natural color and texture variations in the fibers create subtle disruptions, softening an otherwise geometrically guided composition. The deliberate use of the word “painting” to categorize his constructions complicates the notion of the painterly surface and reconsiders what it means to participate in an art practice not typically elevated to the status of “fine art”.